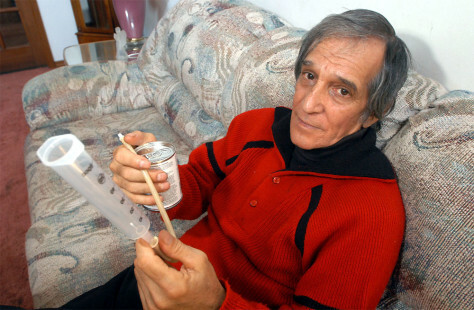 Frank Amodeo, of Orlando, Fla., holds the feeding tube he has had to use for 17 years, in this Oct. 27 photo. Amodeo was a plaintiff in the Florida smokers class-action suit against the tobacco companies. The Florida Supreme Court is to review a lower court ruling throwing out a record financial award and a decision allowing the state's smokers to sue as one.